This part of the puzzle uses pentominos to replace the answer digits obtained from the previous part. Pentominos are the 12 basic shapes obtained by combining 5 squares and are conventionally labelled as below. Divide the grid into distinct pentominos (flipped or rotated as necessary) such that the total of the answer digits in each pentomino is the same. 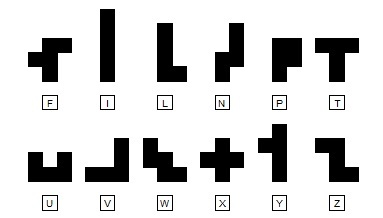 To enter, submit your answer to the first part plus the pentomino fill for the second with the 5 squares for each shape filled with the appropriate label letter as above. Finally, submit a more appropriate title for the second part. To enter this competition, send your entry as an image or in list format to ccpuzzles@talktalk.net before 8th January 2017. The first correct entry drawn from the hat will receive a 3D Puzzles Calendar which has been donated by 3D Crosswords.